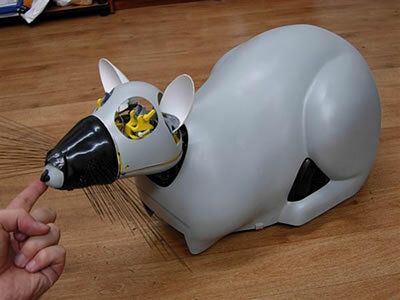 Psikharpax the robot rat is the creation of a team of French roboticists. Rather than setting their sights on human-level intelligence, they're trying to figure out and replicate the behaviors of a simpler creature - the rat. "The rat is the animal that scientists know best, and the structure of its brain is similar to that of humans," says Steve Nguyen, a doctoral student at ISIR, who helped show off Psikharpax at a research and innovation fair in Paris last week. Psikharpax has two cameras for eyes, two microphone ears and a set of tiny wheels for locomotion. Four inch whiskers do more than decorate its pointed snout; these vibrassae are intended to be a part of the robot's sensory system, just like that of an organic rat. Data from these artificial organs goes to Psikharpax's "brain," a chip whose software hierarchy mimicks the structures in a rat's brain that process and analyse what is seen, heard and sensed. For instance, if Psikharpax's eyes sense that it is dark, the software gives a greater weight of importance to data from the whiskers, in the same way that a rat, at night, relies on other sensors to compensate for loss of vision. Robot rat survival is the goal - avoiding human beings on the one hand while finding 'food' - electricity provided at power points throughout the lab. Out of warrens in the wall, tiny robot mice darted. The rooms were acrawl with the small cleaning animals, all rubber and metal. They thudded against chairs, whirling their mustached runners, kneading the rug nap, sucking gently at hidden dust.